Kevin Young, Atticus Haygood Professor of English and Creative Writing, and Curator, Literary Collections and Raymond Danowski Poetry Library. Emory Photo/Video. 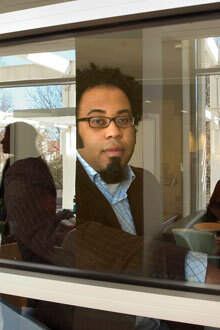 Emory University award winning poet Kevin Young has won the 2013 PEN Open Book Award for his book, "The Grey Album: On the Blackness of Blackness," given by the PEN American Center, the largest branch of the world's leading literary and human rights organization. The award is given "for an exceptional book-length work of literature by an author of color published in 2012." Young is Atticus Haygood Professor of Creative Writing and English and curator of literary collections and the Raymond Danowski Poetry Library at Emory. "Every year PEN’s literary awards recognize the brightest lights in literary fiction and nonfiction and honor the sustained careers of writers who are distinguished in their fields, raising awareness for a diverse array of outstanding books,” says PEN President Peter Godwin. "These awards represent the best of PEN’s work in defense of free expression throughout the world — fighting censorship, promoting translations into English, and honoring both the new and well-known authors who make up the core of PEN as an organization. Their voices amplify our advocacy work." Judges called "The Grey Album," published by Graywolf Press, "an ambitious, exhilarating, impassioned work of Black literary and cultural criticism, unlike any other—an inspired, sweeping book that deserves to be savored and celebrated." Earlier this year, "The Grey Album" was a finalist in the National Book Critics Circle Award in Criticism, and was named a New York Times Notable Book for 2012. Young's edited work, "The Collected Poems of Lucille Clifton," was named one of the Best Books of 2012 by Publishers Weekly, and is a Hurston/Wright Legacy Award nominee. Young is the author of seven books of poetry and editor of seven other collections, including "Ardency: A Chronicle of the Amistad Rebels" (2011), winner of an American Book Award, and "Jelly Roll" (2003), a finalist for the National Book Award and winner of the Peterson Poetry Prize. He is a faculty member of Emory's Creative Writing Program, home to a growing nucleus of preeminent writers and scholars who are attracted to Emory because of its broad strength in literary arts that make it a leading university for writers and students of writing. Award winners will be honored at the 2013 PEN Literary Awards Ceremony on Oct. 21 at CUNY Graduate Center's Proshansky Auditorium in New York City. Among the other recipients this year are Pulitzer Prize-winning journalist Katherine Boo, former Poet Laureate Robert Hass, acclaimed playwright Larry Kramer, co-editors of Mother Jones Monika Bauerlein and Clara Jeffery, and sportswriter and NPR correspondent Frank DeFord.